Playa de la Arena is characterised by its rugged coastline and black volcanic beach which has held the Blue Flag award for over 25 years! The beach offers sunbed and parasol hire, together with showers and disabled facilities. Reina Sofia, Tenerife’s southern airport, is less than 19 miles from Playa de la Arena. 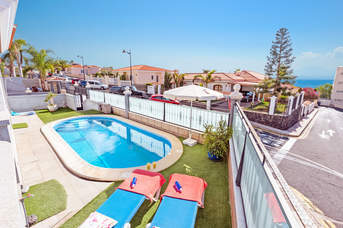 The resort is a growing tourist centre but is quieter than some of Tenerife’s more lively resorts, so would suit those in need of a relaxing holiday. From Playa de la Arena you can enjoy the stunning black cliffs, black sandy beaches and little coves that characterise this region of Tenerife. Clear weather permitting, you can see across the water to La Gomera. For watersports, wind surfing and diving lessons, equipments are available, while there are plenty of shops, cafes and restaurants nearby to amuse the family between beach sessions.Reina Sofia, Tenerife’s southern airport, is less than 19 miles from Playa de la Arena. 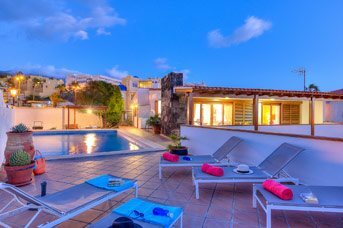 The resort is a growing tourist centre but is quieter than some of Tenerife’s more lively resorts, so would suit those in need of a relaxing holiday. From Playa de la Arena you can enjoy the stunning black cliffs, black sandy beaches and little coves that characterise this region of Tenerife. Clear weather permitting, you can see across the water to La Gomera. For watersports, wind surfing and diving lessons, equipments are available, while there are plenty of shops, cafes and restaurants nearby to amuse the family between beach sessions. 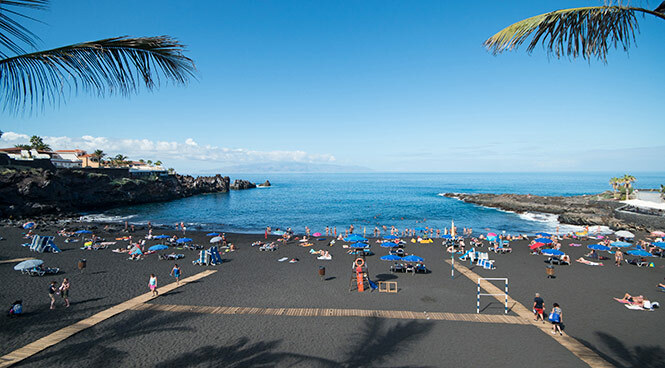 Playa de la Arena on the west coast of Tenerife has a stunning natural beach formed of black sand. The waters are crystal clear, popular with anyone wanting to try snorkelling or diving due to its rich marine life. Studies by NASA have shown that this stretch of coastline is said to have the best climate in the world! This is a popular destination for holidaymakers looking for a smaller resort but which offers all the amenities. There are lots of restaurants lining the beach offering both international and typical Canarian cuisine together with minimarkets, bars and shops and the little fishing port of the neighbouring village, Puerto Santiago. Just over a mile away is the beautiful village of Los Gigantes with its breath taking cliffs and boat trips out to see the whales and dolphins.